An all-natural topical magnesium supplement infused with essential oils that targets the stressed and overworked muscles. Magnesium4Muscles in a 20 ounce trigger sprayer. Great for the athlete, trainer, team coach or anyone that wants more coverage of this amazing topical supplement. Enjoy 15 lbs of the best bath minerals on the market. Get your whole team or gym enjoy the benefits of using Magnesium4Muscles. This option is the most value for your money. 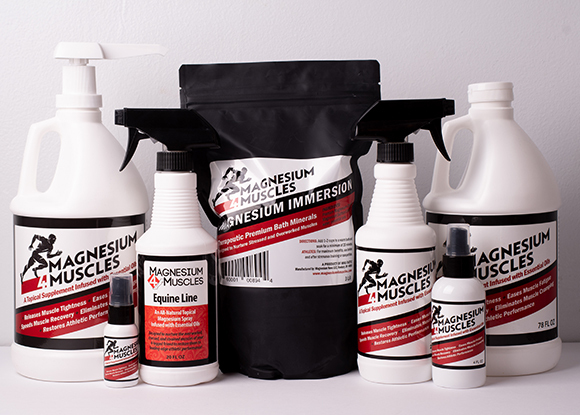 Equine Line is the horse edition of Magnesium4Muscles. A topical magnesium spray infused with 4 essential oils. To be applied to the stifles to hooves of your favorite 4-legged friend. © Magnesium News - 2019. All Rights Reserved. Website Design by Alpha Key Digital.